JazzTimes - "SINNERS is such pure, exhilarating fun that it's easy to forget just how much skill went into crafting it." No Depression - "The live energy and cohesion is the album's primary merit; it plays like a joyride in a wagon full of good and good-humored jazz musicians." 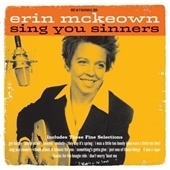 Dirty Linen - "Quirky without ever seeming peculiar, Erin McKeown embodies everything that's good about contemporary folk music..."